In typical Russian automotive tradition, the Lada Niva that began production in 1977 is still being produced today using almost exactly the same design. 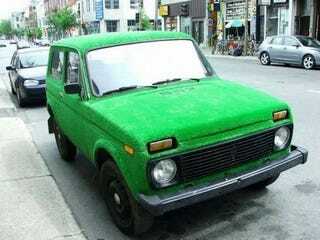 This monotony may explain what inspired one Niva owner to cover their car in Astroturf. Throughout the Niva's 33 year production history it has at times been exported to Canada as well as parts of South America and Europe where it has been fairly well received thanks to a reputation for being tough and affordable. Jeremy Clarkson almost admitted he liked one in the midst of an (almost entirely true) anti-communist car tirade. Although Lada Nivas never made it officially to American shores, the owner of this Lada brought a little bit of America to his/her Niva by covering it in one of our greatest American innovations; Astroturf. When Astroturf was invented in 1964 for athletic fields, I can't imagine the inventors ever thought someday anyone would cover their car in it. If by some far stretch of the imagination one of them did, I can guarantee that the car they envisioned was not a Lada Niva.